The Envato Elements plugin has been officially released. Read why this is such good news for all Elementor users. Back in September, we first mentioned the beta release of a promising Elementor template plugin made by Envato. Now, comes the official launch of the plugin, including its integration with the Envato Elements subscription service. So, What Does Elements Do, Exactly? FREE templates – 2,000+ templates, 80+ complete website template kits. Premium stock images (Included in their paid subscription) – 680,000+ royalty-free images. All these assets are smoothly integrated into our editor, to help you find templates and images anytime you need them. Envato is connecting their Envato Elements subscribers with this plugin, offering them a complete suite of everything a web professional might need to build a website. In this post, I want to go over why this launch is a huge deal for both Elementor, as well as its community. For the past 15 years, the first step users made when they wanted to create a WordPress website was choosing a theme. The came to ThemeForest, Envato’s leading theme marketplace, and picked a theme of their liking. This was the absolute standard process for setting up a site. We launched Elementor three years ago with the clear intention to replace this ‘first stop’, and now – it’s happening! When the first-word processor came out, it took a while until it took over typewriters. It’s only natural for the same transition to occur with Elementor. Tools like WordPress and Elementor rapidly improve thanks to the fact they are open source, and evolve through third-party contribution. This kind of improvement would not be possible with technology that is not open source. 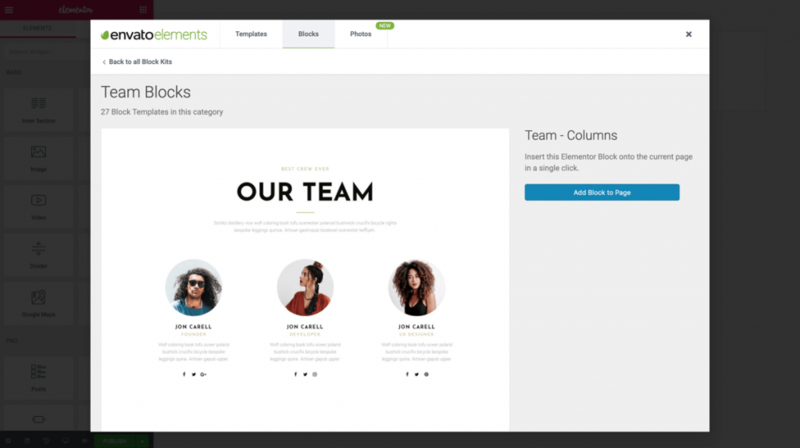 With partners like Envato, continually adding new templates and resources, the Elementor team can put even greater focus on the editor, and is able to develop groundbreaking features like this year’s popup builder, flexible layout, and motion effects. With Elements, our users can enjoy access to an unimaginable and ever-growing number of templates and images, as well as other design assets which will be integrated into the editor in the future. Envato is connecting their Envato Elements subscribers into this plugin, offering them a complete suite of everything a web professional might need to build a website. With an Envato Elements subscription, you’ll have access over 1,000,000 assets across graphics, video, music, sound effects, fonts, and even courses and educational material. The Elements plugin is free, but if you want to have access to photos and other assets, check out Envato Elements subscription service. In the last few months, we received great feedback from users who tried the beta version of Elements. I’d appreciate if you try out the free plugin, and possibly sign up to the subscription service, and let me know how it goes. Coincidentally I found it yesterday and I installed it, it is quite complete. Very useful for when you are not inspired. Can’t really comment on their current subscription value, however I had this subscription for couple of years and found really no value in it. The major problem came with themes and plugins. I used a few of themes, after sometime when update was required, went to Element and found that theme was removed from platform and I had to purchase a single site license from themeforest. That was really frustrating. Luckily my theme purchases from themeforest has gone down to zero almost after switching to Elementor. Hoping that this time they have add some real value to subscription and will not do the same practice again. This is awesome. Normally with other page builders or even themes you get one or two nice templates and the rest are boring. But with the templates that come with Elementor pro and this plugin from Envato you have so many great options. Our team @ creativeground.com.au just love your work. You really have set the benchmark alot higher. Hi guys. That sounds awesome. How does that come with the pro version of Elementor. Is it still necessary? Do you keep exclusive assets/features on the Pro version and templates on Elements? This is awesome! Elementor has been a game changer and glad Envato is keeping up with it. I just signed up with the monthly plan. I think I will purchase the yearly plan after looking at the stock photo collection. That alone is worth the price. It is better than the stock photo service I am using now. Are these templates like the other Elementor blocks? And do pictures + elements save after a subscription ends? I need to do a quick build and can then let it sit for about 6 months before I really dive into it. Just curious as to whether or not I can do a short subscription and then still interact with pieces I’ve added once the subscription is cancelled. Looks very promising! Also – you addressed those especially who “make a living off building website” – Is there a growing market for Elementor-specific website developers? And if we were to use a subscription service like this for 3rd party clients – are there any sales / legal limitations. And then, likewise for my own site and above query, will the client then have issues with their own internal team modifying the site when I was (or potentially, currently / still active) the subscription holder? I’ve got to add this. You need to go to the Envato Elements website and not just use the plugin. It really is a one-stop creative assets site. I’ve been going to different sites for stock photos, videos, audios and fonts. They have it all. VERY impressed. It would be nice if we didn’t have to install the plugin just to browse the library of templates – an online gallery would take it to another level. you guys rock. So many great features recently released. Absolute game changer! 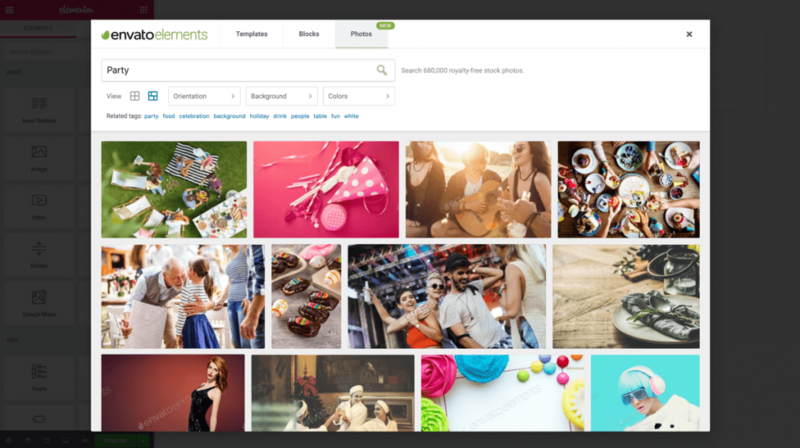 We are already subscribed to Envato Elements for access to photos, videos, and other digital assets. This will certainly reduce the level of effort in designing websites as you no longer need to download media, upload media, etc. The fact that we can search and insert a photo directly in Elementor is amazing! Hi Everyone, I love the background music in the above video does anyone know the authors name or where I can get it? This is awesome! Elementor has been a game changer and glad Envato is keeping up with it. I think I will purchase the yearly plan after looking at the stock photo collection. That alone is worth the price. It is better than the stock photo service I am using. This seems like a really cool launch. Thanks Elementor team. 1) I like Elementor Pro. Even with its bugs, limitations, and incomplete, poor documentation, I still like Elementor Pro. 2) This is an advertisement for Envato’s $198 per year subscription. 3) What are the plugins? Neither Elementor nor the Envato site describe the plugins. 4) Examining the features of 2,000 themes requires a great amount of time. 5) Little information is given in the advertisement. It is mostly praise for Envato. Envato Elements could be used with Elementor or need Elementor pro ? Could be used on any theme ?